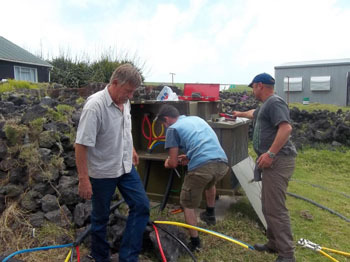 BFBA Electrical Consultants (RSA) were appointed in 2012 by the Government of Tristan da Cunha to design and implement a new underground electrical reticulation system for the Settlement. In turn BFBA, led by Patrick West, designed the system, obtained tenders and appointed VE Reticulation as the contractor for the works, assisted by the local workforce. The first phase of the works included trenching and laying of LV and MV cables, construction of plinth bases for the MV transformers, road crossings and preparation works for the final connections. The second phase of the works consisted of installation of the MV mini-subs, kiosks, street lighting and final connections. Prior to final switchover, the electrical meters were replaced in both houses and government buildings. Finally, redundant transformers and connections were made safe and the kiosks had barriers erected as well as reflective tape applied to these and certain streetlights. Once the water project is completed the overhead power cables and redundant street lighting will also be removed. 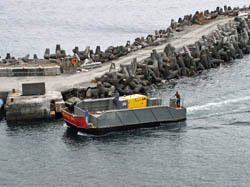 VER sent materials and contractors to the island in the first quarter of 2013. The first phase started with trenching, crossings and cable laying from April 2013 to July 2013. These works were done in conjunction with the Electrical & Plumbing Section using teams of local labour. Consultant visited in Oct/Nov 2013 to oversee the final phase of the work, to ensure compliance and do the handover. All handover certificates were supplied, as-built schematic diagrams and certain certifications. The contractors left in mid November 2013 with the local teams completing the installation of new electrical meters to all buildings, barriers and reflective tape. Therefore, the entire project took in total approximately six calendar months to complete. This is a notable achievement with valuable training and experience gained. Due to the lengthy lead-in to the project, there was a reasonable amount of time to fully design and cost the project to ensure VFM (value or money) and a good specification. The consultants, BFBA from Cape Town RSA and contractors VER , took the project in their stride and delivered the completed electrical reticulation system to an excellent standard whilst allowing spare capacity for growth should the need arise. If anything, as always with the remoteness of TDC, procurement was the main issue that had to be overcome but generally it was well managed and did not cause unnecessary and costly delays. Special mention must be made of the local teams led by Robin Repetto, Head of the Electrical & Plumbing Section as well as the visiting contractors from VER, Deon Brand & Wynand. (see picture right) . The second leg of the project started on the 8th October 2013. Sub stations that arrived were positioned on concreted plinths awaiting the arrival of the electrical engineers to connect the new MV cables. Plinths for street lights were constructed and concreted into place. Paths and roads damaged by the trenching have also been repaired and the remaining cables to the last houses have been completed. The electrical engineers arrived back on the island aboard MV Edinburgh on 9th November. 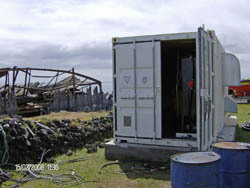 MV/LV connections to the step-up station have been made. Power to the first mini-sub was switched on 16th November and the first section of streetlights tested. These were put on over night to see their effectiveness with good results. I am pleased to say the first leg of the electrical project has now been completed. Service cables to the local homes have been laid, buried and all, except one of the kiosks have been installed and connected. A clean up has been carried out and the grassland is pretty much as it was before we started. 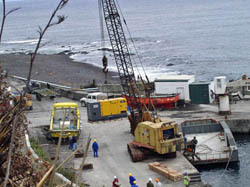 When the Edinburgh arrives W/B 17th June, we will start with the plinths for the streetlights, installing new distribution boards to the local homes and the Government buildings and preparing for the contractors who are due to return in November with the mini-substations to finish and complete the work. Photograph of the contractors and islanders who worked on the project at a farewell party in the Prince Philip Hall which proved to be premature as MV Edinburgh was forced to return to Cape Town and it's departure is delayed until later in the month. Work is progressing well and we have made good distances in spite of the weather. We are installing 4 x 200KvA minisubs and 1 x 315 substation, but unfortunately these didn't arrive on the Edinburgh as the ship was full and will only arrive on the next sailing in May. 6.6Kv cables have been laid to the 4 minisubs and supply cables to the Kiosks that will house the breakers for the houses. Service cables have been laid to some of the houses, but no connections have been made. These will probably be connected into the houses towards the end of the work. The Electrical Reticulation project started on 2nd April 2013 and great progress has already been made as shown by the photographs taken on 3rd April of work to dig trenches and insert cables. All the cables are laid underground. The first MV cable of 6.6KV has been installed and progress is being made to bury it and start on the next stage to the next mini substation. The project is being coordinated by Electrical Engineers Deon Jacobus & Wynand de Bruyn who arrived aboard MV Edinburgh on 26th March and can be seen in the photos. Editor's Note: We look forward to more reports from Robin on this project and the resulting improvements in what is an outdated electricity supply system on the island, still using the old round three pin plugs commonly used in the UK. As Robin's old English teacher it is heartening to have to consult a dictionary to look up the term 'reticulation' and trusts others who may not know the word so are grateful for an alternative heading for this news article! It is also another example of the importance of a good education for Tristan Islanders, who need a much wider technical knowledge and skill as their community develops with up to date facilities. "The alarm was raised at around 0400 this morning when the Factory was seen to be on fire. A fierce south westerly meant that by the time the fire engine arrived, nothing could be done except to let the Factory burn itself out. No one was hurt. But the community is understandably shocked and dismayed at what has happened. However, it could have been so much worse. 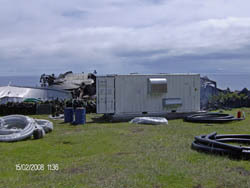 Had the wind been blowing in a different direction the diesel tanks would probably have gone up too. And as the fishing season has ended, the loss of revenue to the island is minimised. 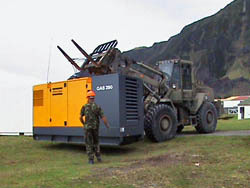 However, also destroyed were the generators used to provide the island with its 24-hour electricity supply. 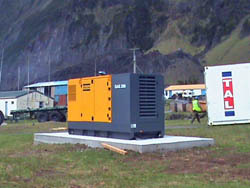 Work is currently in hand to link the standby generator to the mains, so that islanders can keep their freezers going. The hospital has its own standby generator. 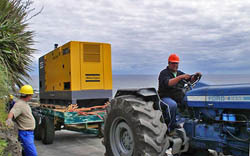 Power will be rationed and carefully managed until new generators can be supplied by Ovenstone from Cape Town". 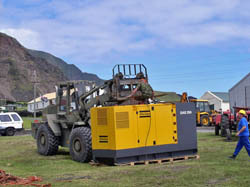 Following the Factory fire, the sigh of relief felt by the Tristan community following the connection of the standby generator was premature. Sadly, the machine failed during the evening of Friday 15th February, with overheating problems. By Sunday morning, frozen stores in islanders' freezers were beginning to soften, and salt was issued in case the meat needed to be salted. Frozen stores were consolidated as much as possible. Happily, following a weekend of work by the Factory team, the generator was repaired and restarted during the afternoon of Sunday 17th February. Power supplies have been fine since and the island currently enjoys electricity from 0730-2130. Candles remain on ration, although the Administrator understands that the RFA Lyme Bay may have some to spare when she arrives next Thursday. 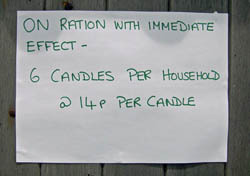 Administrator David Morley took this telling photograph advertising the rationing of candles on the Island Store's door. 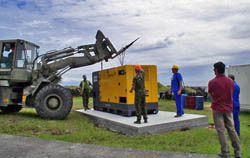 Photos taken on 7th March show the new generator arriving. It was transported aboard MV Edinburgh, but then transferred to the RFA Lyme Bay for delivery on one of the RFA's heavy duty barges. 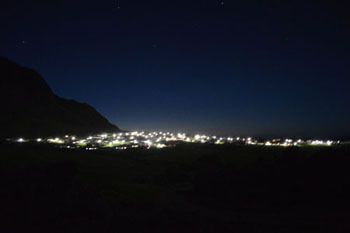 Full 24/7 electric power was restored to the Settlement as the new generator supplied power beyond 21.30 hours for the first time since fire destroyed the old generators on 13th February. This operation was carried out in an incredibly short time thanks to Operation Zest, a project to repair Calshot Harbour and re-deployment of the RFA Lyme Bay and the Task Force of RA engineers.